Maids vs Butlers: Card Battle GO! is a card and dice battle game. Create your Battle Deck using your favorite maids and butlers, and compete against other players. You can design your deck with only butlers, only maids, or a combination of both. Will you focus your deck on maximizing combos, or will you collect your favorite characters - harem style? Shuffle your deck and draw your five cards that will face off against your opponent. From your five cards, choose your first fighter and the roll the attack dice. “Lock” in any attack dice that boost your attacks, and reroll (up to 2 more times) any dice that aren't locked in. After 3 rolls or both players have locked their dice, reveal your card and GO! Maids vs Butlers: Manor Mayhem is a PvP adventure board game. Characters from the card game come alive as miniatures trying to win the praise of the the Master of the Manor, while working to get the rest of the staff fired. 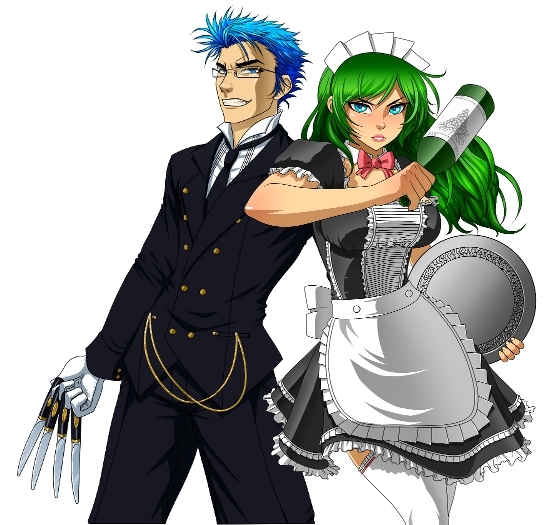 Maids vs Butlers: Manor Mayhem can also be played as an optional cooperative, story-driven adventure. There are unique victory conditions that ensure a versatile and highly replayable experience. Maids vs Butlers: Manor Mayhem is also be designed to connect the manor gameboard to future gameboard sets to create games such as Maids and Butlers vs. Pirates, or Maid and Butlers vs. Magical Girls to name a few options.